A Trade Mark is a visual symbol in the form of a word, a device,or a label applied to articles of commerce with a view to indicate to the purchasing public that is a good manufactured or otherwise dealt in by a particular person as distinguished from similar goods dealt or manufacture by other persons. The objective of the Trade Marks Act, 1999 is to register trademarks applied for in the country and to provide for better protection of trade mark for goods and services and also to prevent fraudulent use of the mark. The Trademarks Act, 1999 provides protection to the owner of a trademark and imposes criminal liabilities for the infringement of the trademark owner’s rights. To enjoy protection, the owner of a trademark must apply for registration with the Trademark Registrar of the Registry of Trademarks, India. The Trademarks Act is also applicable to the protection of service marks, certificate marks and collective marks. The Trade Mark Registry Office performs the statutory duties in connection with the registration of Trade mark and other activities related thereto. Trade Mark offices are located in Ahmadabad, Chennai, Kolkata, Mumbai and New Delhi. PRODUCT TRADEMARKS: are those that are affixed to identify goods. SERVICE TRADEMARKS: are used to identify the services of an entity, such as the trademark for a broadcasting service, retails outlet, etc. They are used in advertising for services. COLLECTIVE TRADEMARKS: are registered in the name of groups, associations or other organizations for the use of members of the group in their commercial activities to indicate their membership of the group. About 12 to 18 months depending on various factors. Sometimes it can be longer if there are objections from the Registry or from third parties to be overcome. Importantly, protection will back-date to the date of your application and anyone who has been using your name illegally since that date will have been infringing your rights and may be liable to you in damages. It lasts 10 years and can be renewed for further period of 10 years. If you do not pay your renewal fee by the next renewal date, your mark will expire. However, you are allowed an extra six months from the renewal date in which to renew your registration, but you will have to pay a fee for late renewal. Following this six-month period, there is a further six-month period, i.e. a total of up to one year after the renewal date, in which you may apply to restore your mark. An INDIAN trade mark registration only covers INDIA. It does not, therefore, afford protection in any of other country, and a separate application must be filed in each of these countries if registered protection is required. (2) A single application may be made for registration of a trade mark for different classes of goods and services and fee payable therefore shall be in respect of each such class of goods or services. Provided that where the applicant or any of the joint applicants does not carry on business in India, the application shall be filed in the office of the Trade Marks Registry within whose territorial limits the place mentioned in the address for service in India as disclosed in the application, is situate. 1) Make a public search before filling of application for trademark. d. After the selection of class, return to the public search, write the class number in the prescribed field. Then, write the word mark for which application is to be made. We can search word mark by splitting the word so that the similar trademark search will be displayed. e. Click on the search button, the trademark similar to proposed trademark will be displayed on screen. f. After public search make an application for registration of trademark, through offline or online. 1. Procure a class III digital signature from any of the Indian Certifying Authorities and install the same on your computer. 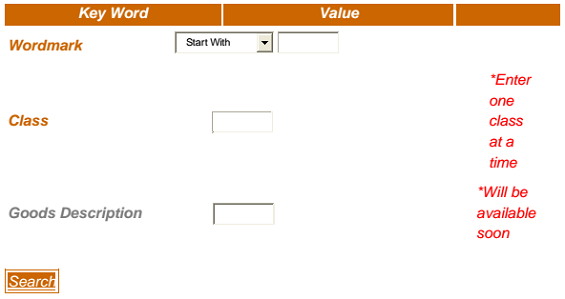 Create an ID and password which will be used at the time of filling applications. On submitting the documents whether online or offline an application number will be generated for the said trademark, which can be used to check the status of application made. Format of all the documents are enclosed herewith. Note: In the case of change of logo of existing trademark registered, a new application is required to be filled with the Registrar of Trademarks. Application is hereby made for registration in the register of accompanying trademark in class 45 (FORTY FIVE) in respect of Legal services; security services for the protection of property and individuals; personal and social services rendered by others to meet the needs of individuals., being included in class 45, in the name of (COMPANY NAME) working as a Company whose address is (REGISTERED OFFICE) who claims to be a proprietor thereof and by whom the said mark is proposed to be used/ used since (DATE) in respect of the said goods and services. All communications relating to this application may be sent to the following address in India. Note: If trademark to be registered contains colour then provide coloured copy. TM 1 should be filed in triplicate i.e. three copies and two sheets of additional representation. The above class and word is for example only. In case Company is making first time application a code will be allotted to them, for further application they have to write it on TM- 1. We are enclosing herewith the application in Form No. TM-1 in the triplicate for getting the Trade Mark as ‘WORD’ along with two copies of the representations. You are requested to approve the application so that we can take the further action. E- Stamp Certificate No. …………………. We, (Company Name) having its registered office at (Address), do hereby authorize (vide Board of Directors, Resolution No. …….. dated ……………) Mr. ……………….., Director/ Professional with address, to act as our agent for the purpose of making application and obtaining registration of Trademark of, under the provisions of the Trademark Act, 1999 and to represent us in all the matters in connection therewith and to maintain registration in force and to act in all matters under the act and also authorize them to sign and execute such deeds and documents on our behalf and also the appointment of substitute(s) as may be necessary and expedient and request that all notices, requisitions and communications relating thereto may be sent to such agent at their Address. We hereby revoke all previous authorization, if any made, in respect of same manner or proceeding. On Behalf of M/s …………………. Note: A receiving can be taken on photocopy of this attorney which can be used for another application made by the Company in case the authorized representative is same. The said photocopy can be used instead of obtaining fresh General Power of Attorney. CERTIFIED TRUE COPY OF THE RESOLUTION PASSED AT THE MEETING OF THE BOARD OF DIRECTORS OF M/S ………… HELD ON ………….. AT THE REGISTERED OFFICE OF THE COMPANY. “RESOLVED THAT the consent of the Board of Directors of the Company be and is hereby accorded to authorize Mr. …………, Director of the Company/ professional with membership no. to sign, execute all kind of documents required for registration of the Company’s Logo as Trade Mark. It is compulsory to get registered as a Trade Mark Agent for representing client before the Trade Mark Registrar, i am a practicing Company Secretary, if yes under which section/rules??. very useful and guiding info. I want to register a trademark in joint names, how should i proceed to get the proprietor code? or can you give brief on procedure for registration of trademark in joint names( two to three individuals). Please contact us for trademark registration at +91-9717004510 or asianiplawyer@gmail.com. you can also send us all your questions regarding brands, logos, Indian trademarks and international trademarks. VERY VERY USEFUL INFORMATION. KEEP WRITING. Thanks, very useful and informative.